Langille's Plumbing & Heating Limited - installing all types of water pumps since '63! We never give the availability of our water supply a second thought until we have a problem. Then we discover how vital it is to drinking, bathing, cooking, washing and day-to-day living! 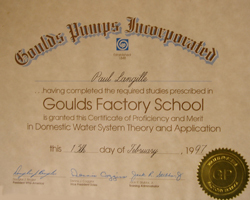 Langille's Plumbing & Heating is proud to feature Goulds Pumps, one of the world's largest manufactures of pumps. Goulds Pumps have been building reliable, trouble free, high performance pumps for 150 years. We trust Goulds and are confident the pumps we install are reliable and provide good value to our customers. Can you take a shower or fill a tub while the lawn is being watered? Would you ever knowingly flush a toilet while someone is showering? Is your pump large enough to handle back-washing your water treatment system? 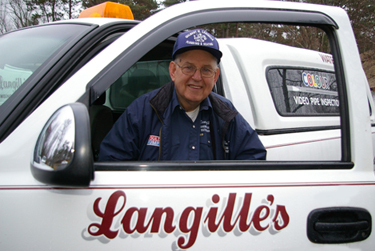 Gilbert Langille started Gilbert Langille's Plumbing & Heating in 1963. His son, Paul joined the company in 1980, and bought the business in 1997, renaming it Langille's Plumbing & Heating Limited. Plain and simple, a pump that is too small can't deliver water fast enough to supply the demand - its capacity is too little. Our factory trained technicians help our customers make informed decisions about what system is right for them. One of the recent advances in the pump industry is the introduction of the balance flow pump system. A balance flow pump efficiently delivers constant pressure even when flow conditions vary. Our customers get reliable, constant pressure for showers, irrigation systems, washing machines and dishwashers - even when more than one appliance is in use. Whatever your water distribution need, you can trust Langille's to make it happen.